When it comes to treating the leg veins, the best analogy that I have heard, is comparing them to a large waterfall. The idea is to treat the underlying problem first, then to treat what is left, and finally any cosmetic issues. Obviously, if there is no underlying problem, the cosmetic issue may be addressed directly. One can imagine a large waterfall on the side of the mountain with smaller waterfalls down below, most of them resulting from the larger waterfall. If one attempts to build a dam to block each of the smaller waterfalls, but ignore the large waterfall, then new smaller waterfalls will result, from the water, which is still flowing from the large waterfall. If on the other hand, a dam is built to block the large waterfall, then many of the smaller waterfalls will dry up. Those that are remaining can then be blocked by building individual dams, and will have a much better chance of staying blocked, without forming new waterfalls. The same is true for the treatment of veins. The long saphenous vein is a superficial vein, which extends from the ankle to high in the thigh, where it empties into the deep vein – the femoral vein. There is a one-way valve allowing blood to flow from the saphenous vein into the femoral vein. If this valve is not functioning properly, blood flows back into the saphenous vein, which then influences all of the superficial veins extending all the way down to the ankle. In this regard the abnormal long saphenous veins can be compared to the waterfall. There are tributary veins which empty into the saphenous veins, when the saphenous vein backs up, it backs up into the smaller veins, creating varicose veins, which could be likened to the smaller waterfalls. If these veins are treated by removal, but the large saphenous vein is ignored, then the recurrence rate will be very high, new varicose veins would form. Much like smaller waterfalls, if the large waterfall is ignored. If on the other hand, the saphenous vein is closed first then many of the varicose veins will shrink. Some may disappear. Those that do remain can then be treated and will have a much lower recurrence rate. 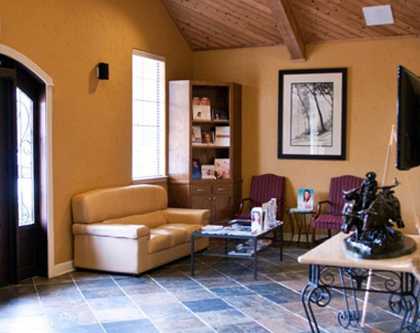 When we treat leg veins, all of the surgical procedures are performed in an office setting, using local anesthesia. If the saphenous vein is abnormal, it is treated first by performing a laser ablation. Following this, the bulging varicose veins are observed to see how much they shrink. If they disappear, or shrink to the point that the patient is content with the results, then no further procedures are performed. If there are residual bulging veins, these can be addressed, by performing a microphlebectomy. Removal of the residual bulging veins through 2mm sized incisions.) This minor surgical procedure is also performed in an office setting. Call Texas Vein & Cosmetic Specialists today to schedule an initial evaluation.